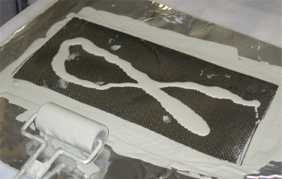 Starfire Polymer-to-Ceramic™ Technology uses Starfire’s unique pre-ceramic polymers to create strong polymer matrix composites (PMC) or hard, tough ceramic matrix composite (CMC) materials which can be used in numerous applications for a variety of markets. 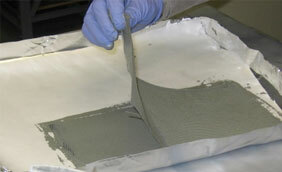 Wet layup employs liquid slurries, materials typically used exclusively for initial composite fabrication. 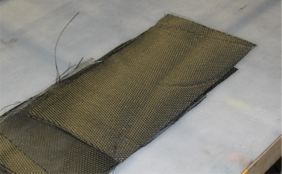 Wet layup systems consist of Starfire polymer(s) and specific active or inactive fillers which are applied to a type of fiber reinforcement or fabric. 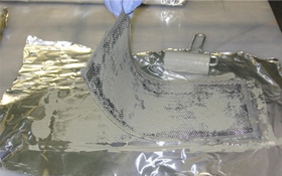 Once the wet layup is complete, a green body is created which can be handled, machined, or pyrolyzed. 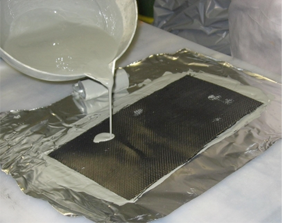 Set up for wet layup by collecting fiber or fabric reinforcement, preparing slurry, including addition of catalyst and assembling tools such as rollers. 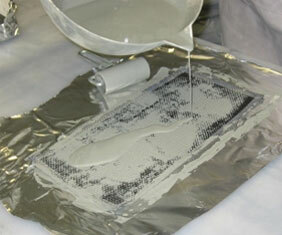 Place a piece of fabric onto the layup area and pour slurry over the surface. Pour slurry across the surface. Add enough liquid to completely cover the entire ply after rolling. 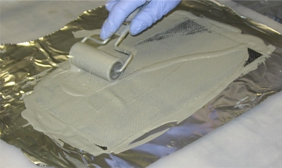 With a roller, roll and spread the slurry across the surface and onto uncovered areas of the face of the fabric until the surface is completely covered. If dry spots persist, add more slurry. 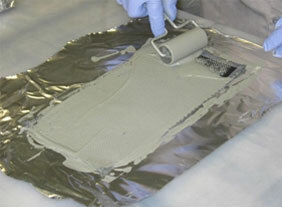 Once the entire surface is covered with slurry, flip the sheet over. Once the ply is covered on both sides, queue for curing, debulking, or pressing. Stack plies as appropriate for the desired layup and orientation to create a laminate stack. Consolidate per your green body creation method to yield a cured thermoset part.